Recently we saw the reveal of the dub cast for Benjamin Renner and Patrick Imbert's feature The Big Bad Fox And Other Tales. The English cast is full of the cream of British talent, lead by Bill Bailey, Phil Jupitus, Celia Imrie and Adrian Edmondson. Now we've actually got our first chance to hear them in action as a new trailer has been released by UK distributor Studio Canal. We'd already fallen in love with the film's animation style (which comes straight from Renner's original comic), via the earlier subtitled trailers. The new trailer gives us our best look at it so far, giving a taste of the film's episodic structure. And the dub? It sounds pretty great to us, with the acting style blending naturally with the film's playful tone. It's hard to put a finger on just why, but somehow it feels more naturally suited to British voices than it would with a US cast. Perhaps it just feels that bit more European? Whatever the reason- it seems to work well. The Big Bad Fox And Other Tales will be released in the UK and Ireland on August 3, 2018. GKIDS Films are set to release the film in the United States some time this autumn. 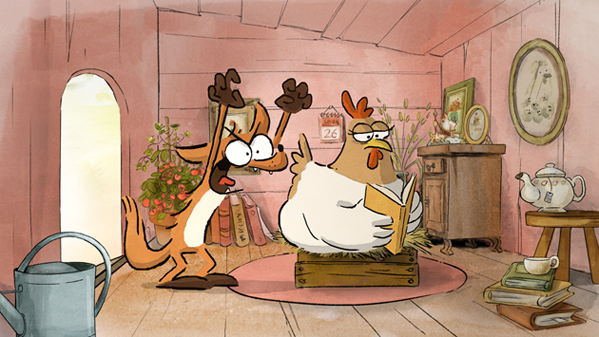 From the creators of the Academy Award nominated ERNEST AND CELESTINE, comes THE BIG BAD FOX AND OTHER TALES, a hilarious adventure about a gang of animal misfits. See it in cinemas August 3.